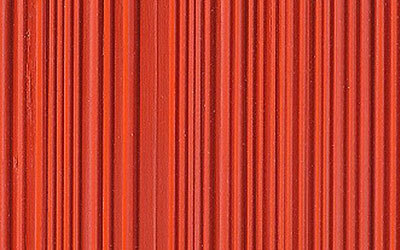 “Weldtex” also known as combed or striated plywood was a unique vintage pattern produced originally from the late 1940’s – 60’s. It was originally created by Donald Deskey, who also designed the Crest toothpaste logo, the Tide bulls-eye as well as a widely used New York City lamppost model. He was a native of Blue Earth, Minnesota. He studied architecture at the University of California, but did not follow that profession, becoming instead an artist, and a pioneer in the field of industrial design. In 1940 Deskey developed a decorative form of plywood which had a unique striated, or combed, look to it. It was produced under the name Weldtex by U.S. Plywood and was very popular in the 1950s. Using relatively inexpensive plywood his new product provided a unique accent to walls and ceilings. As time progressed this wonderfully creative product was used by such notable architects as Frank Lloyd Wright, Gregory Aims, and a host of others. Though primarily used as an interior accent wall material, it was also used as exterior siding and soffit material. 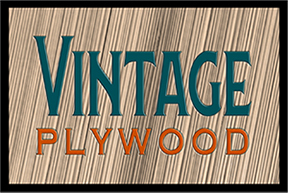 We enjoy getting email (info@vintageplywood.com) from folks describing their experience with this material. Please feel free to shoot us an email with your story. We learn new aspects of it’s use from people all over the U.S. We’d love to hear you story. We have been producing MCM Eichler exterior siding for over 25 years. From time to time we would get calls regarding Weldtex asking if we produced it or knew of a source for it. Eventually we decided to explore the possibilities of manufacturing it since no other source could be found. After much trial and error we found success and folks have expressed to us our pattern is often very close if not an exact match to their pre-existing Weldtex. We have discovered that many people have seen this material in days gone often in a relatives home. However the original trade name “Weldtex” has long been forgotten by many people. Also some know it by combed or striated plywood. In fact if one does a search on Frank Lloyd Wright and “Weldtex” nothing seems to surface. But if the search term “combed or striated” plywood is used, at least one of his homes in Carmel CA. emerges.